A collection of faience ornaments from Harappa. The Harappans developed a very compact glassy faience that was produced in a variety of colors, ranging from white, to blue green, deep blue and even red-brown. On the left is a disc shaped ornament of blue green faience. Parallel ribbing of light blue green alternates with white paste in the bottom of each groove. This unique ornament may have been sewn onto cloth or inlaid onto a metal ornament. At the top center is a bead made of red-brown and white faience. This bead is possibly an imitation of the bleached carnelian eye beads. 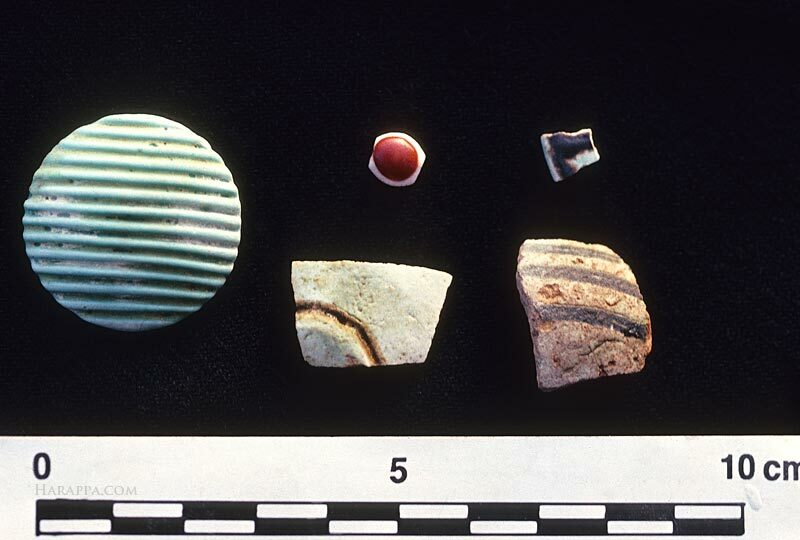 The fragments on the lower right are banded with dark blue and come from small jars, possibly used to hold perfume or medicines.